Having a Jackrabbit as a mascot doesn’t seem odd to South Dakotans. The South Dakota prairie is home to many of the animals, and South Dakota State University‘s athletic teams have been called the Jackrabbits for decades. We don’t find the name to be any more odd than, say, the University of Minnesota’s Golden Gophers. Around the country, though, many people are surprised and amused by the use of a rabbit as a mascot. Perhaps that’s because SDSU only recently made the jump to Division I athletics, and the nation at large is being exposed to the Jackrabbits for the first time. This past season, many television viewers got their first look at the Jackrabbit mascot when the SDSU women’s basketball team made a national tournament run. The Jackrabbit’s real coming-out party, though, is likely to be the upcoming Capital One Mascot Challenge. The Jackrabbit was recently named one of the challenge’s 12 "All-American" finalists for 2009, and sports fans all over the nation will soon see the friendly yet athletic-looking rabbit in a multitude of advertisements. Fans also will have the chance to help the Jackrabbit win the contest. Starting on Aug. 31, Jackrabbit fans are encouraged to visit capitalonebowl.com, or click on the Vote Jackrabbit button on GoJacks.com, and cast their votes early and often, voting once everyday. Established in 2002, the Capitol One All-America Mascot Challenge annually crowns the top mascot in all of Division 1. Previous winners include Monte (Univ. of Montana, 2002 and 2004); Cocky (Univ. of South Carolina, 2003); Herbie Husker (Univ. of Nebraska, 2005); Butch T. Cougar (Wash. St, 2006); Zippy (Univ. of Akron, 2007) and Cy (Iowa State, 2009). 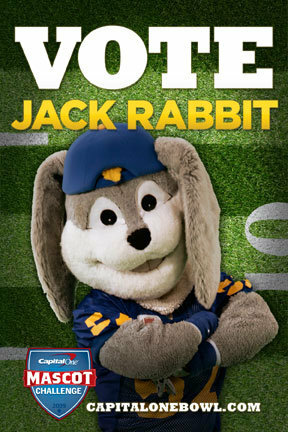 The Jackrabbit was the 2009 winner of the write in votes for the Mascot Challange.